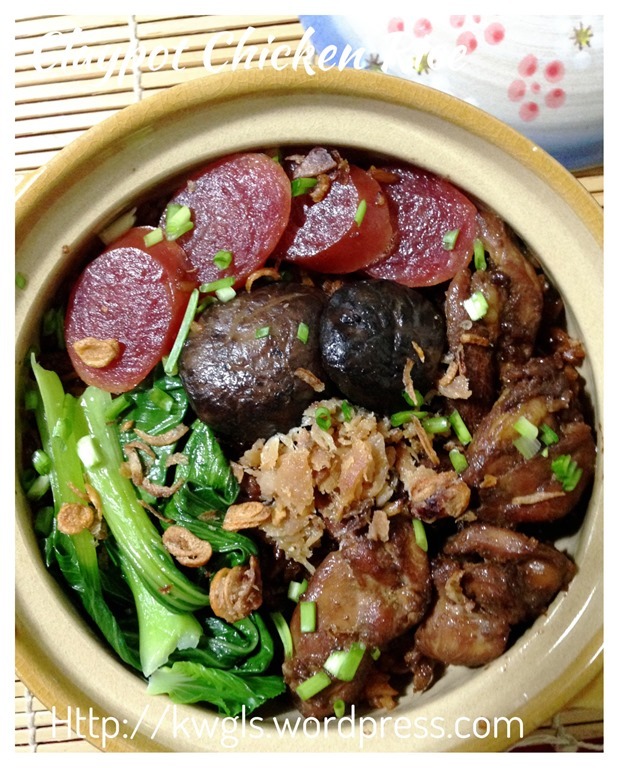 I have to say that this is not the authentic clay pot chicken rice recipe. 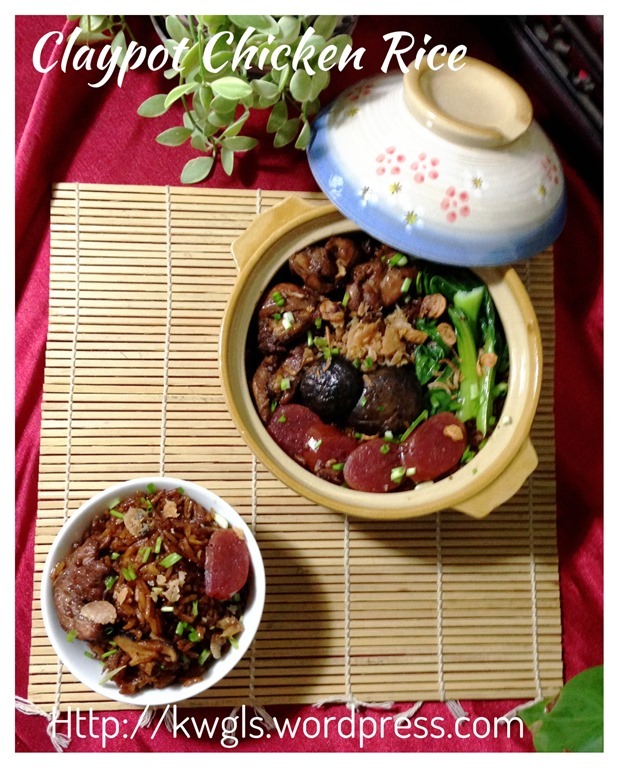 It is prepared using conventional rice cooker and I have amended the method of cooking. However, I can assure readers that the taste will not be compromised much. 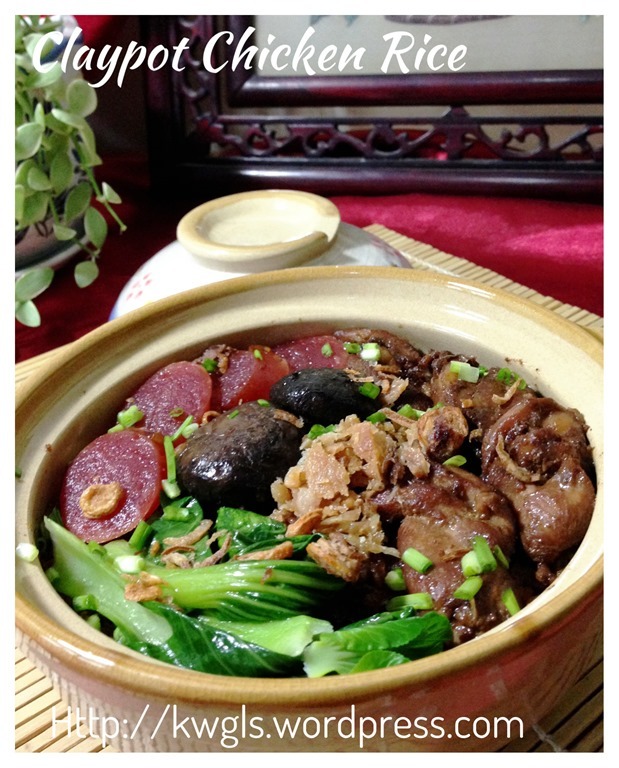 I did not use clay pot to prepare this one pot rice dish for a few reasons. One is that I do not have a clay pot and secondly I do not have the patience and time to monitor cooking rice using clay pots. 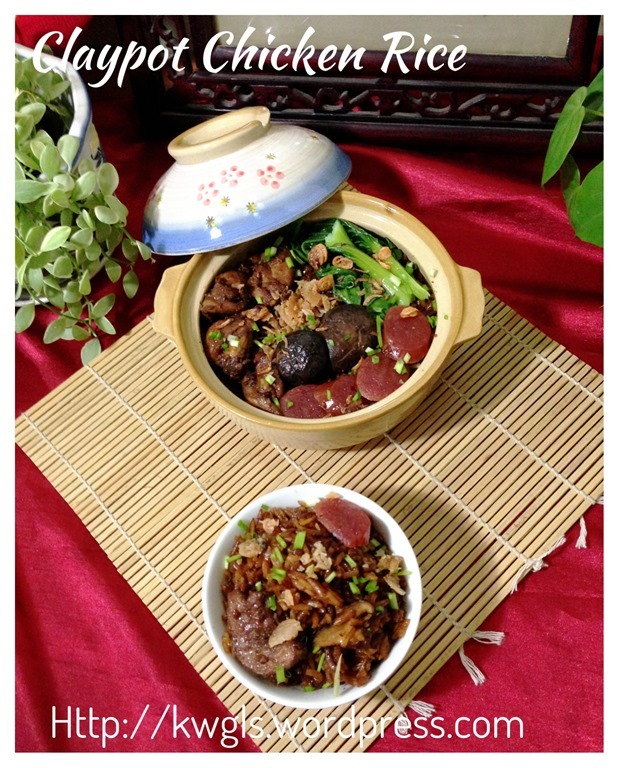 Thirdly, I believed that even if you use the clay pot but using gas stove to cook, the taste will not be very much different from if you cooked using the rice cooker. In order to have a distinct flavour as what were sold in the eating outlets, conventional stove using charcoal have to be used. Therefore I have opted to use the rice cooker to speed up the preparation. 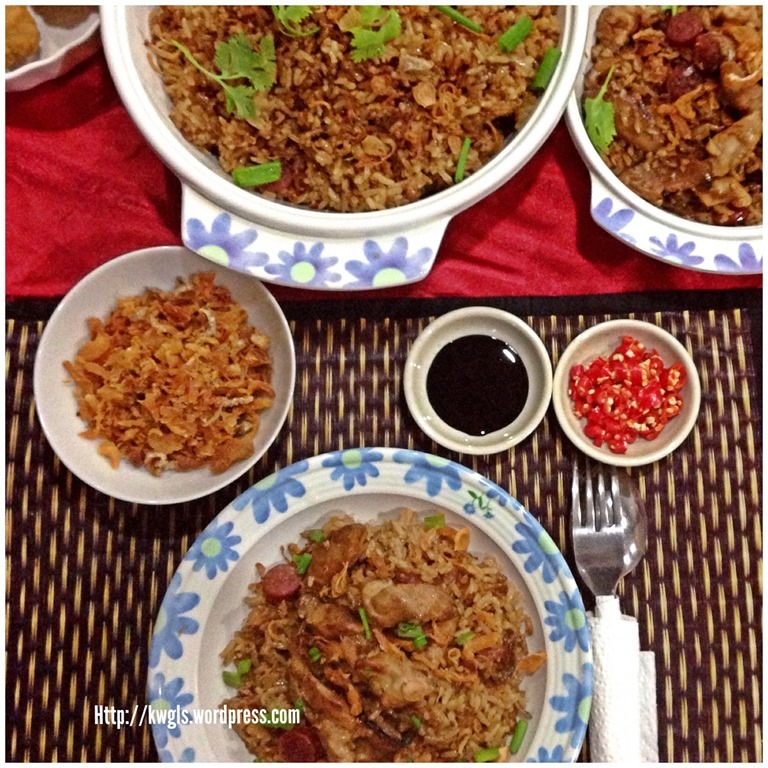 I first try this dish when I studied in Kuala Lumpur during the late 1980’s. What I can always remembered was the long timing I have to wait for any order of clay pot chicken rice. Being a student then, I did not have the patience to wait and ended up usually eating economy rice specially catered for the students. When I get married, my wife is a firm supporter of clay pot chicken rice. 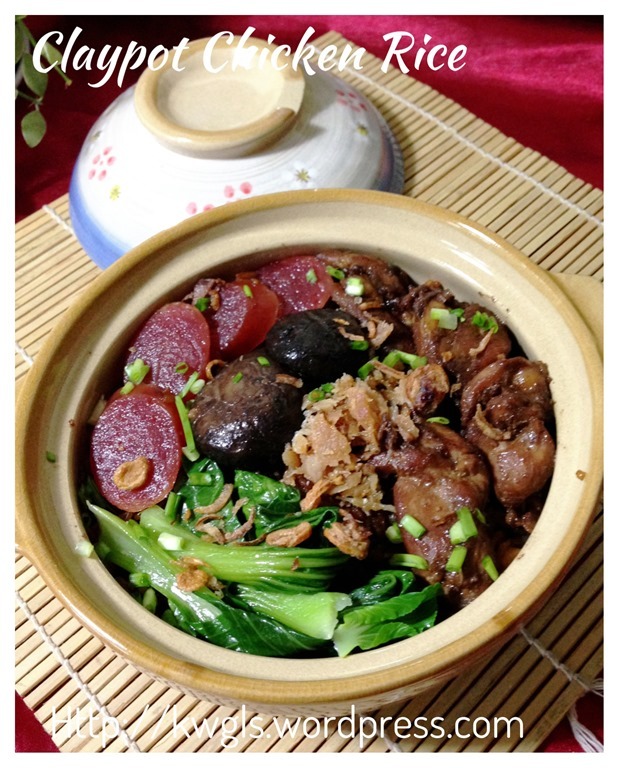 Whenever there is a chance or when she saw there is a store that sells clay pot chicken rice, she would ordered the dish. 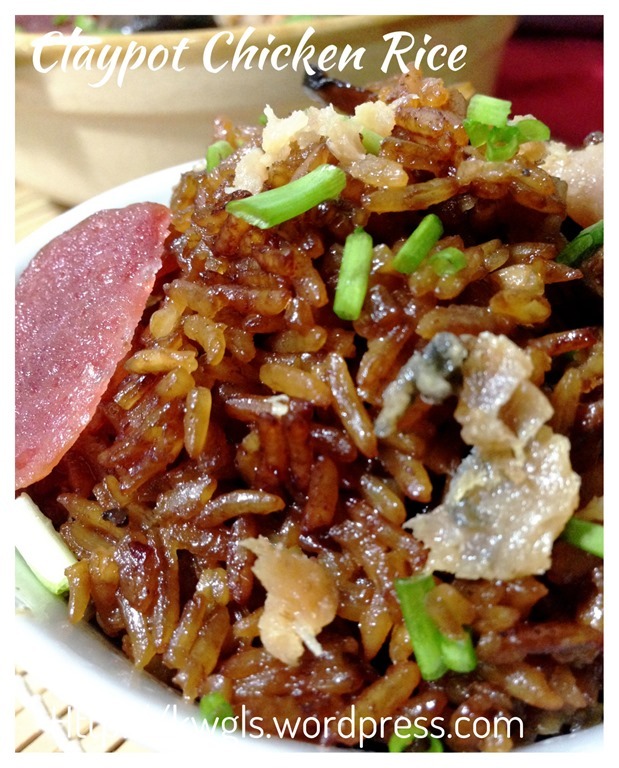 However, there are not many clay pot chicken rice stalls in Singapore as compared to Kuala Lumpur, Malaysia. While I was thinking of what to cook yesterday, my kids were saying that they wanted to eat chicken rice to “break my vegetarian diet fast”! I told them that may be I should let them try another type of chicken rice, but is the darker version of clay pot chicken rice. Note that smoked pork belly, chicken stock and salted fish are optional. 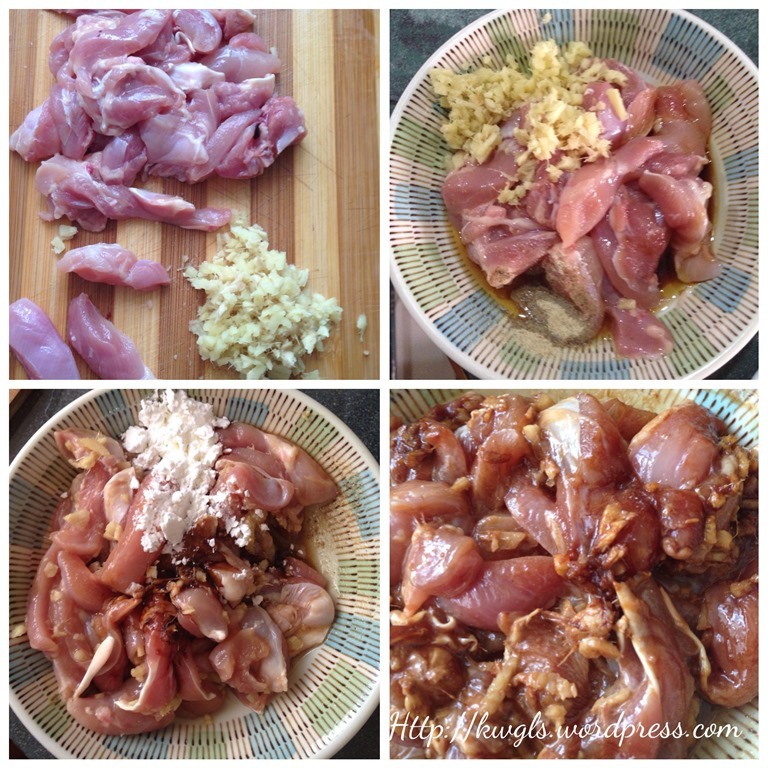 Cut the chicken meat in thin slices. 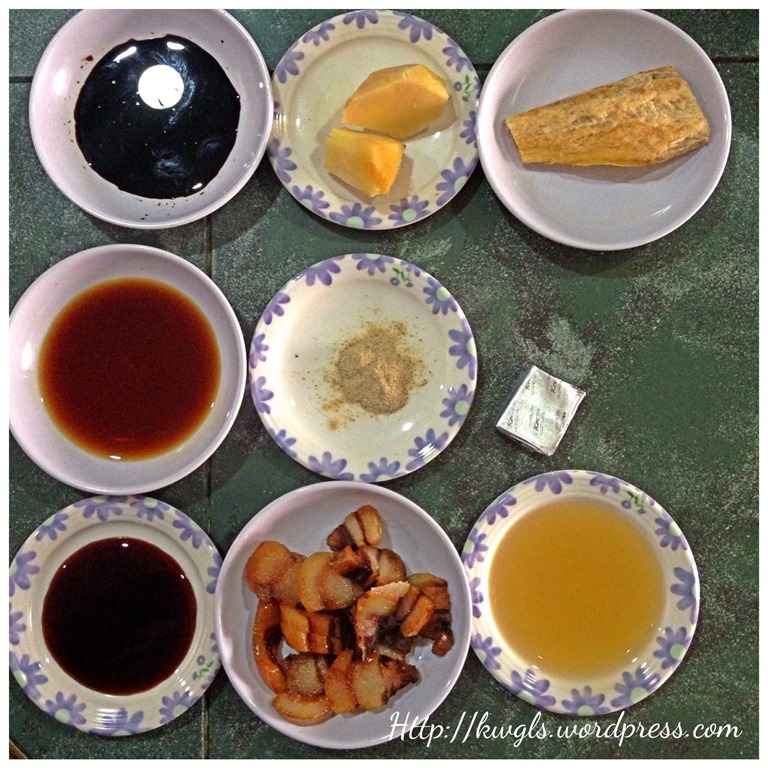 Chopped or shredded the ginger until very fine pieces. Put the chicken meat in a bowl and marinate with ginger, corn flour and HALF of seasonings marked . Marinate for at least 1-2 hours. The longer you marinate, the tastier the chicken meat will be. Tear the salted fish into small strips. 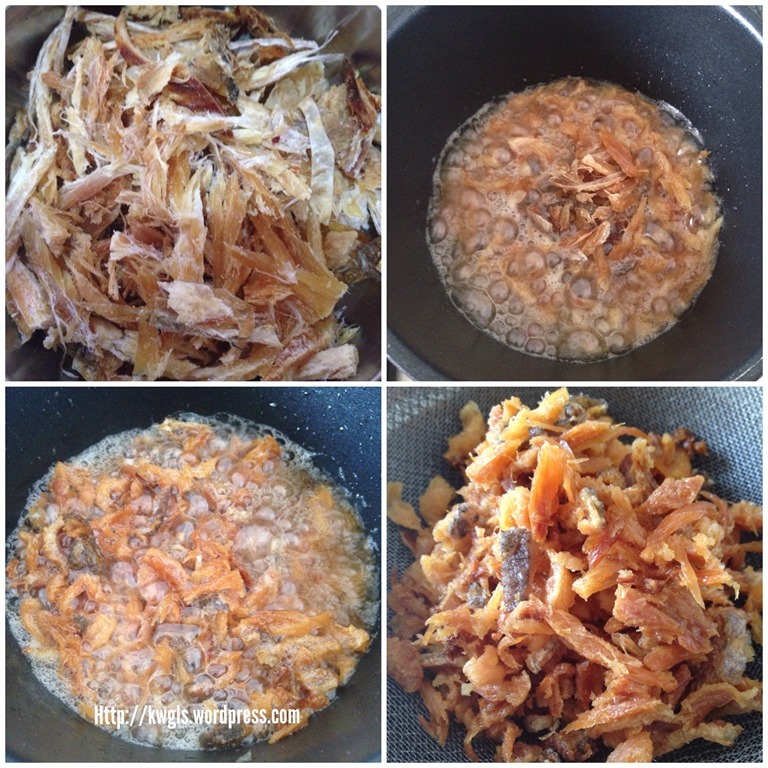 Use medium heat to deep fry it until the salted fish become golden brown and crispy. Drain and put in a piece of oil absorbent paper. Set aside for later use. Note that this step is optional. In this illustration, I have prepared a lot of salted fish for my other dishes. This salted fish was especially good to go with white porridges and fried rice. 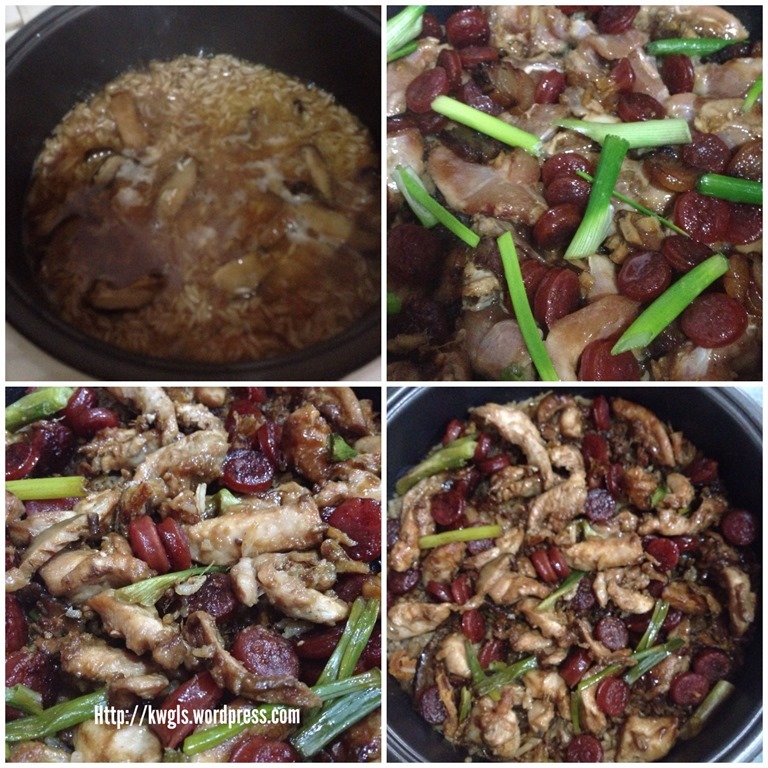 In a frying pan, put a few tablespoons of cooking oils and stir fry the Chinese sausage for a few minutes under MEDIUM heat. Note that this step is also optional. As for me, I would think that this step will enhance the flavour of the Chinese sausages. Using high heat, use the same oil to stir fry the mushroom slices and chopped shallots plus spring onions until fragrant. At the meantime, wash your rice and dilute the chicken stock cube with some water and set aside. 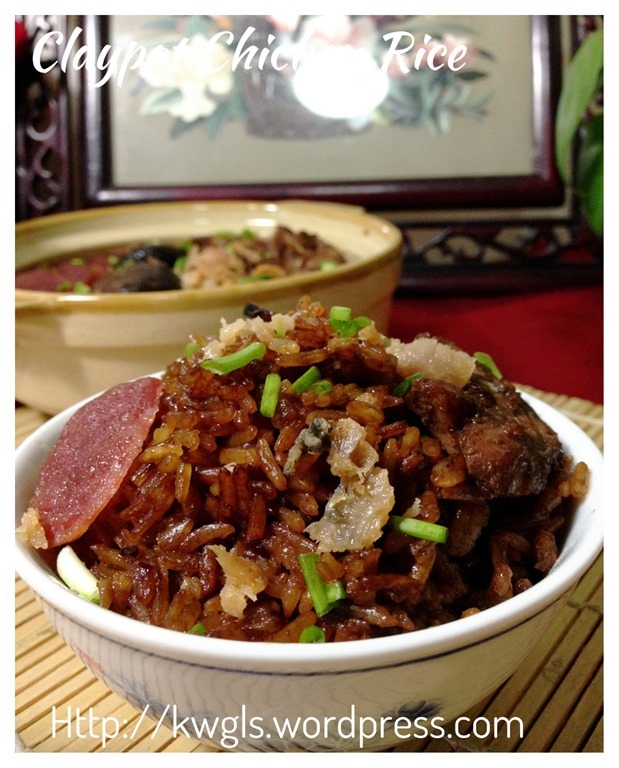 When the shallots and mushrooms are fragrant, add in the washed rice. 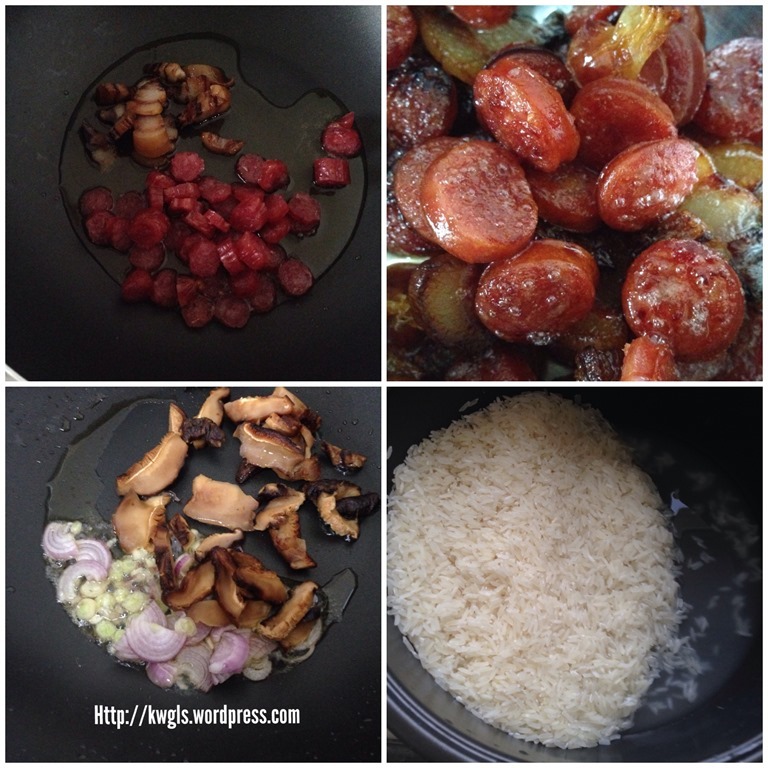 Stir fry for 2-3 minutes. Add the REMAINING HALF of the seasonings marked to the rice. Stir fry of 2-3 minutes until the rice are evenly coated with with the seasonings such as the oyster sauce and dark soya sauce. Add in chicken stock and 3-4 cups of water OR as per the rice cooking illustration in the rice packaging. As the rice had been soaked already, therefore, you may want to reduce the water slightly such that the rice will not be soggy. If you prefer, you can taste a bit of the uncooked rice and assess if there is a need to adjust the taste by adding additional condiments. 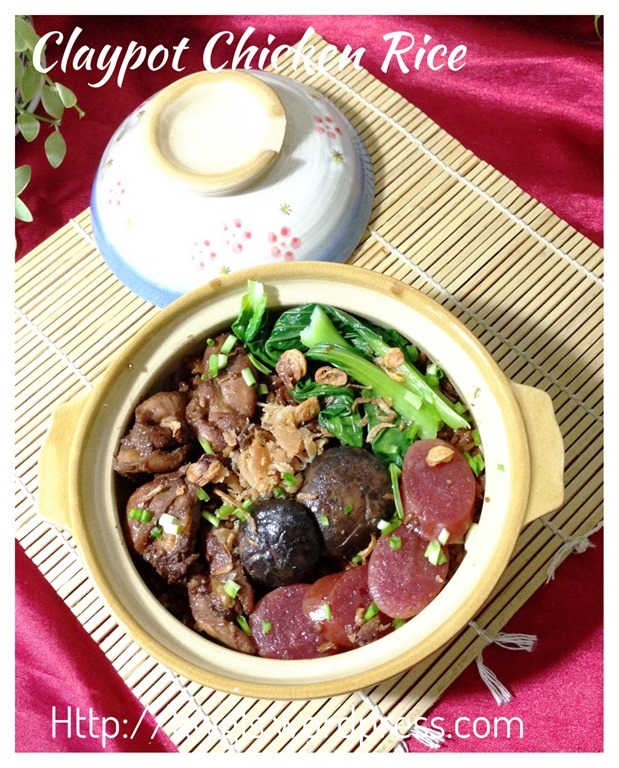 Cook in the conventional rice cooker using the normal rice cooking function or if you are rushing for time, cook using the “Quick Cook” function. Open your rice cooker at about 2/3 of the rice cooking cycle, or check if there are bubbles in the rice and water has started to reduce. 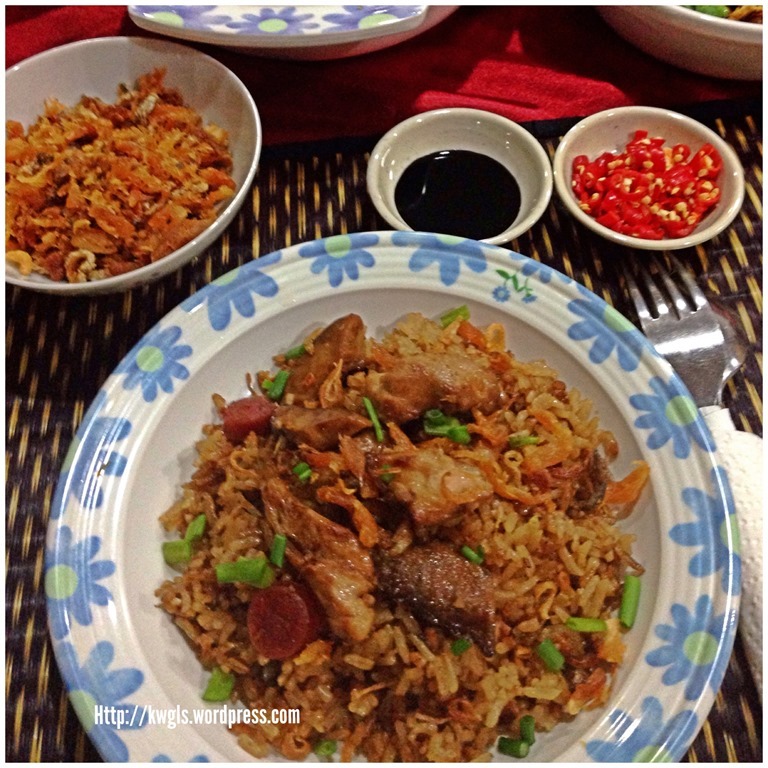 When the rice is about 2/3 cooked, put in 1 tablespoon of deep fried salted fish (optional), green portion of the spring onion, chicken strips and Chinese sausages on top of the half cooked rice. Continue cooking until the rice cooker indicates that the rice is cooked. Let it rest for 10-15 minutes before serving. Note that every rice cooker is different. You have to occasionally open the rice cooker to check the progress of the cooking. For example, if your rice cooker’s rice cooking function is 30 minutes per cycle, you can check the rice cooker at say 20 minutes after you started the cooking. When the rice cooker function is off, the steam will continue to cook the chicken meat and therefore, served only 10-15 minutes later. Best serve hot and garnish with additional spring onions or coriander leaves. 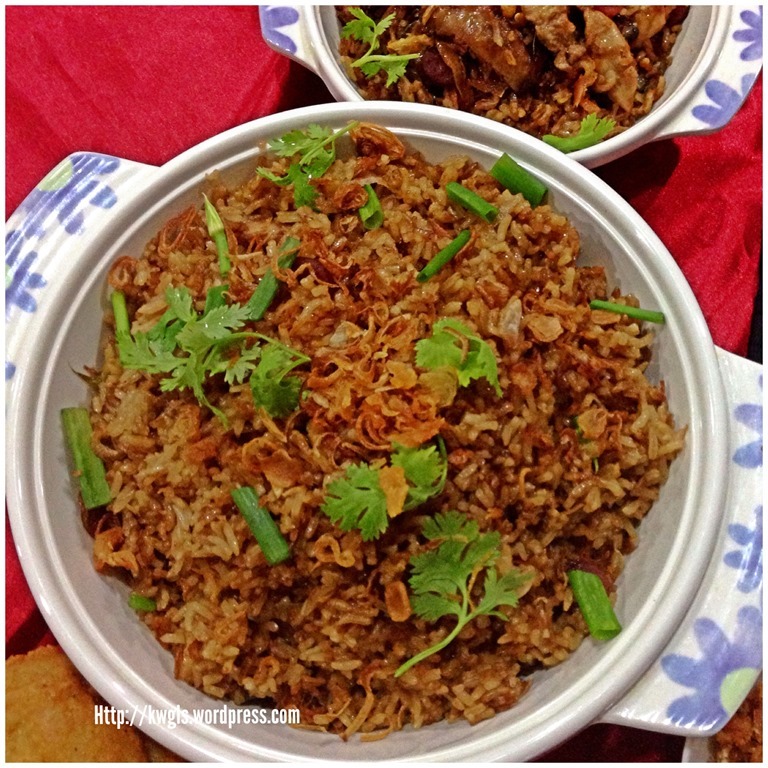 If you preferred, you can put some deep fried salted fish or shallots on top of your rice. It goes well with freshly cut chilli dip in dark soya sauce. This simpler way of cooking have cut short the cooking time by at least one hour as compared to the traditional cooking method using charcoal stove and clay pot with minimal compromise to the taste. 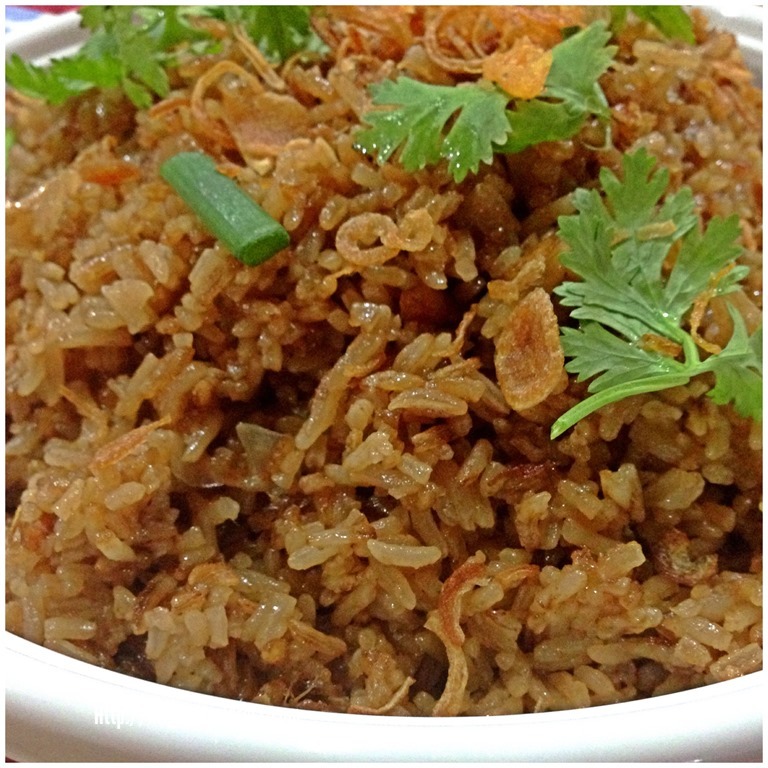 In addition, it is easier to control the texture of the rice . 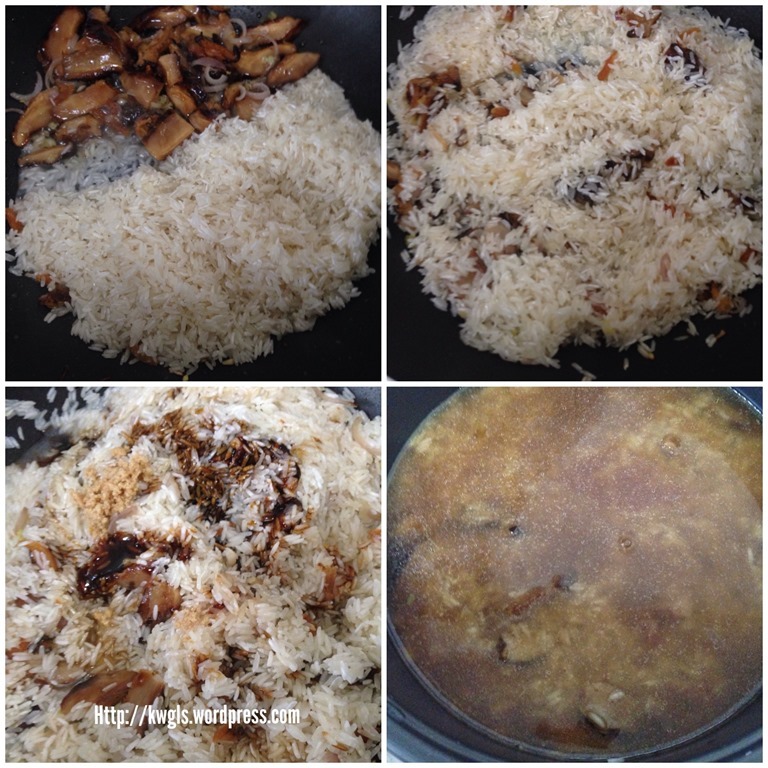 I have pre-seasoned the rice before it is cooked and unlike traditional method, some dark soya sauce was poured on top of the white rice resulting in uneven distribution of spices and soya sauces in the cooked rice. Depending on your taste buds, salted fish or even Chinese sausages are optional. 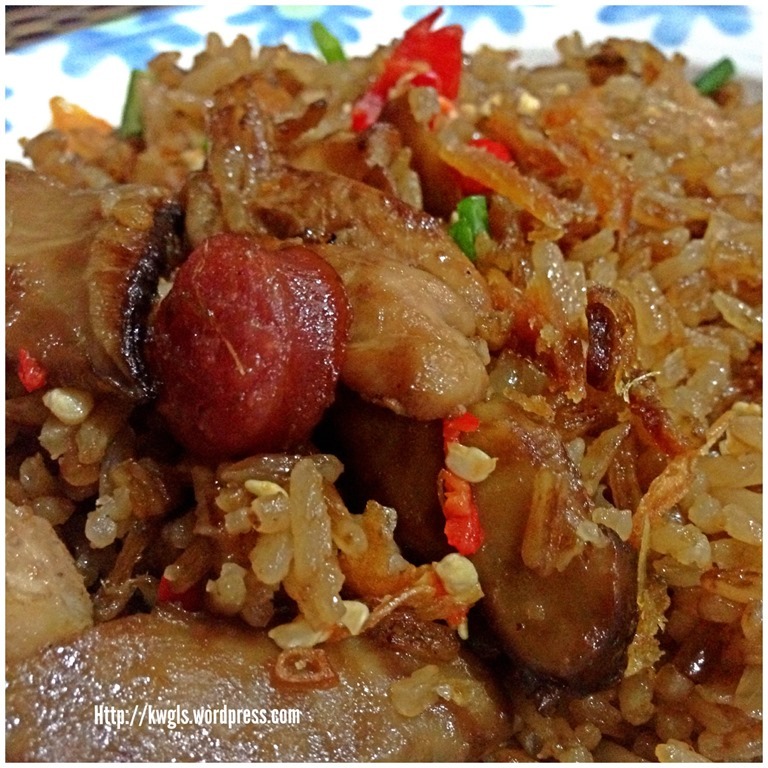 The must haves in this rice dish are the chicken, ginger, sesame oil, oyster sauce and dark soya sauce. 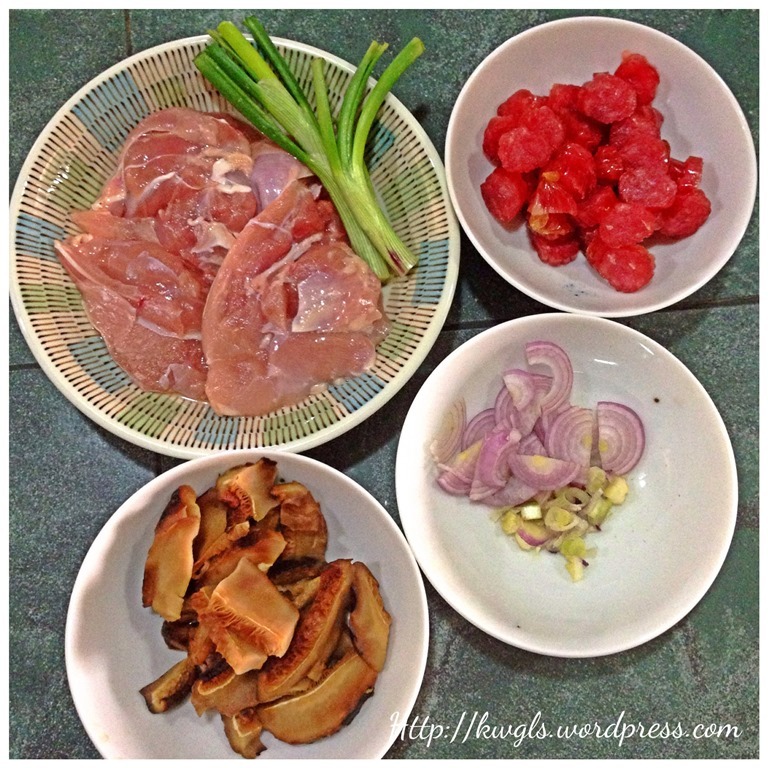 With these minimal ingredients, you can produce an equally satisfactory “clay pot” chicken rice. 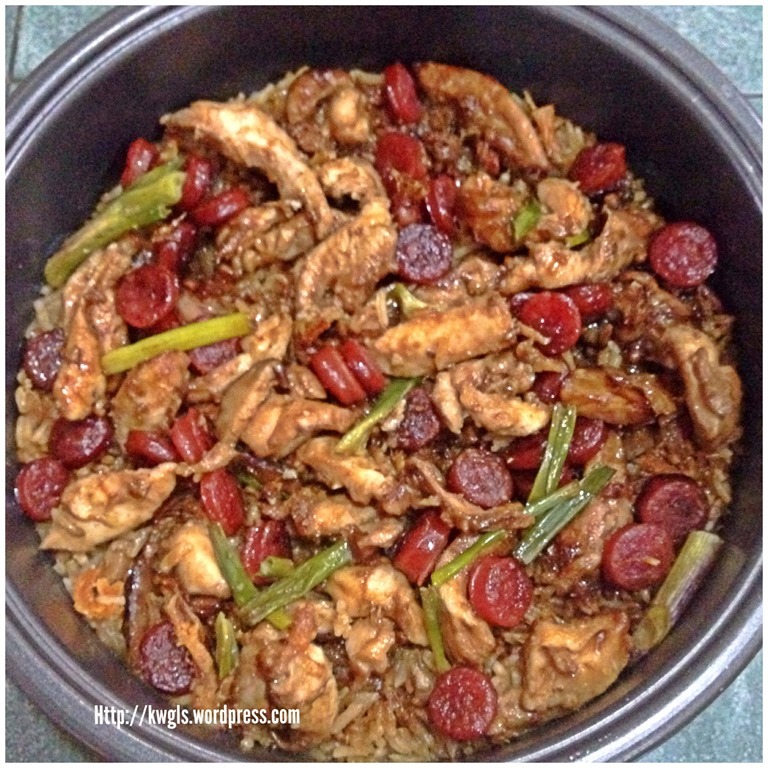 This entry was posted in Dish, Food Preparation Series and tagged 8, Chicken, Chicken Rice, CHINESE, chinese sausage, Clay, Clay pot chicken rice, Claypot, cooker, cups, drumstick, Fish, Meat, pork, postaday, rice, salted, salted fish, SAUSAGE. Bookmark the permalink. G’day! 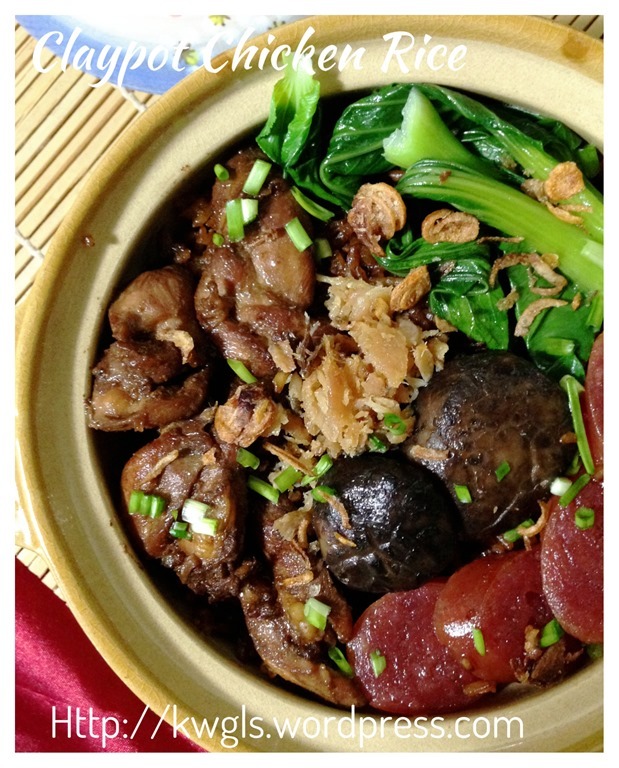 Your title of Claypot Chicken in a Rice Cooker caught my curiosity! Thank you for liking me blog too! Great title and a very attractive dish. Nice work! I want some of this chicken and rice right now! That looks delicious! Thanks for sharing on Saturday Night Fever, pinning this now! May I try to understand, your condiments part says 3 Tablespoon, but that seems alot compare to as shown in picture. May I confirm it is Tablespoon or Teaspoon?